The above offer is valid from 1st of March 2019 23:59 GMT to 1st of December 2019 23:59 GMT and is valid only once per account. The Bonuses cannot be withdrawn. Wagering occurs on real balance first.Wagering requirement for the bonus is set to 50 Times the bonus amount. The wager requirement for the bonus shall be met within Thirty (30) days otherwise the winnings from it will be forfeited. Pocket Casino’s Full Terms apply. All winnings generated from wagering the Bonuses will be credited to your bonus balance. Pocket Casino’s Full Terms apply. To enjoy the 200% match up bonus up to £/€/$ 200 or 2000kr on your first deposit of minimum £/€/$ 10 or 100kr, use the Deposit code “PC200”. Winnings from Deposit Bonus will be capped at 5 (five) times. Only wagers made with Bonus Funds will contribute towards the wagering requirement. Deposit offer expires in 30 (thirty) days. By using the promotion code, you opt-in to the promotion and agree to its Full Terms. Pocketcasino.eu reserves the right to alter this promotion, cancel, modify or suspend any offer and any promotion at any time and without prior notice – in respect of any Bonus that has yet to be provided to You. 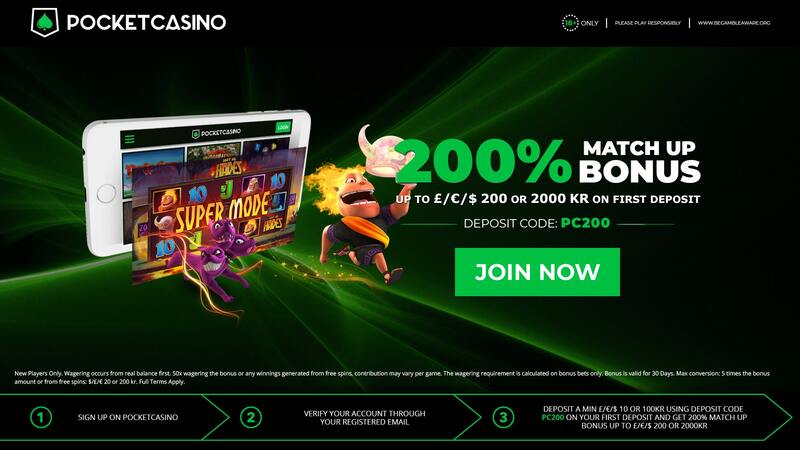 Enjoy an Exclusive Offer of 200% match up bonus up to £/€/$ 200 or 2000 kr on your 1st Deposit. For your second deposit you’ll get 50% up to £/€/$ 300 or kr 3000 & 100% up to £/€/$ 300 or kr 3000 on your 3rd Deposit.